3.6" x 5" x .75"
1. Plan to take encouragement with you. In the middle of our hectic lives, we all need to stop often and remember that our Lord is in control and has a perfect plan for our day. 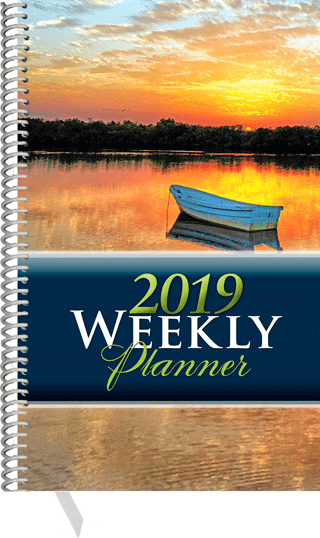 Every week in this planner can be viewed along with a meditation, poem or devotional story written to turn the heart to Christ. Why not pause while planning for a little soul-refreshment and redirection? 2. Convenient ways to stay organized. An attractive and conveniently-sized (approx. 5½" x 8½") book featuring a devotional extract and a “To Do” space on the left-hand pages and a daily-dated seven-section planning layout headed by a full-color illustration, and present and future mini-months on the right-hand pages. We’ve worked hard to make as much room for you to write as we can. You will find month-at-a-glance pages worked in when you need to look at the bigger picture. May also be used as a journal. Full-color laminated cover. The extracts for the 2013 edition have been selected from Comfort of the Scriptures. If you need an even larger size, consider the Inspirational Weekly Planner: Desk Edition with ample room for planning and journaling.